Meghan Frez fires a pitch for Wawasee Friday night. Fretz threw a one-hit gem as the Warriors beat host Elkhart Memorial 14-0 in NLC action. ELKHART – Jared Knipper knows there is something special going on right now with his Wawasee softball team. The Warrior coach just hopes that the magic continues for about five more weeks. 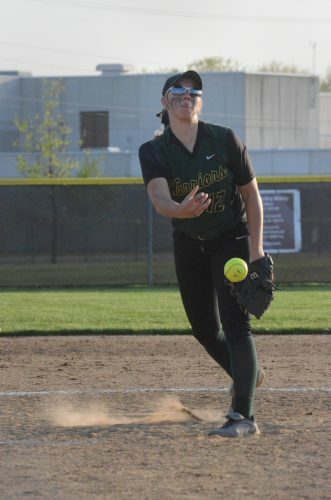 Wawasee was downright offensive again Friday night, in a good kind of way, in pounding past Elkhart Memorial 14-0 in five innings in a Northern Lakes Conference matchup. The Warriors, who were ranked No. 14 in Class 3-A in the latest coaches’ poll, capped off a 3-0 week in league play in impressive and dominating fashion. 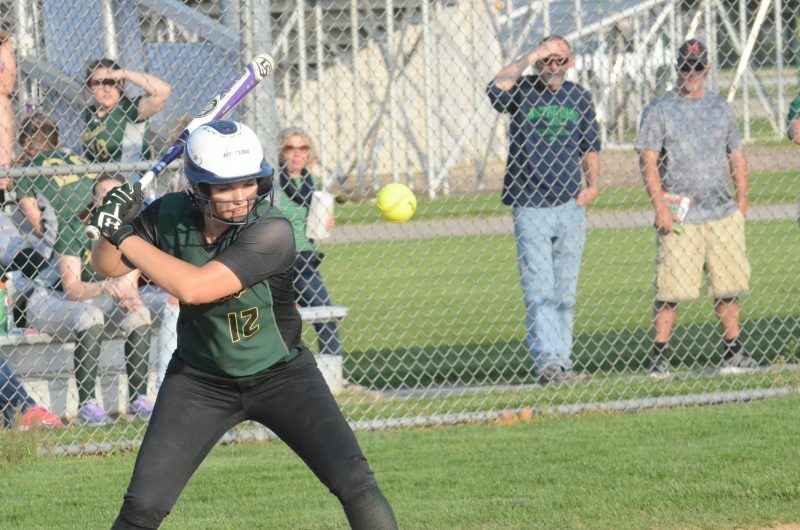 Wawasee piled up 17 hits versus the host Crimson Chargers, including two more home runs. Star Meghan Fretz threw her second one-hitter in two nights in the circle. The talented, hard-throwing junior, who blanked NLC and county rival Warsaw 22-0 with a one-hit gem Thursday night, allowed just a single in the fourth inning to Memorial. Fretz, who is hitting over .600, also went 2-2 at the plate with a double and two RBI to cap an incredible offensive week for her. She hit two home runs in an 8-2 win over Concord Monday and was 4-5 with a homer and five RBI versus Warsaw Thursday night. Wawasee won its eighth straight game to improve to 16-3 overall and sits atop the NLC standings at 8-1. The Warriors, whose lone league loss was a 4-3 decision at NorthWood when they were shorthanded, are three games ahead of anyone else in conference play. Memorial, which scored three runs in their final at-bat Thursday night to edge Plymouth 10-9, drops to 5-13 overall and goes to 4-5 in the NLC. The Warriors beat league foes Concord, Warsaw and Memorial by a combined score of 44-2 this week. “It feels like something special is happening right now with this team,” said Knipper, in his third year. “Our bats are on fire. The lineup, one through nine, is just murdering the ball. This is my 12th year coaching and I have never seen a team hitting like we are. I just hope we can keep it up. The Warriors, who returned all but one player from last year’s strong team that went 20-6 and won the program’s first NLC championship, are just bashing the ball all over the diamond from every spot in their lineup. They had 18 hits Thursday night in the rout of Warsaw. Junior Hanna Haines started the two-touchdown scoring night Friday with a two-run blast in the second inning. Danielle Gunkel, one of four seniors for the Warriors, ignited the pivotal fourth frame with a solo solo to make it 3-0. Second baseman Allissa Flores is on her toes on defense for the Warriors. The Warriors tallied eight runs in the fourth inning to break the game open. Allissa Flores had a two-run single in the onslaught, while Kylee Rostochak, Gunkel and Amber Lemberg each had an RBI single and Fretz a sacrifice fly. Wawasee had seven hits in the inning and took advantage of three Memorial errors. Wawasee put the game on ice with four runs in the fifth inning. The trio of Flores, Fretz and Gunkel each had an RBI single in the frame to make it 14-0. Fretz allowed just a one-out single in the fourth inning to Shaikara Perez. She finished with 10 strikeouts, including striking out the side in the home half of the fifth to close out the game, and two walks. Fretz, who threw a two-hitter with 10 strikeouts in a 10-0 win over Memorial on April 20, just shrugged off missing a no-hitter. 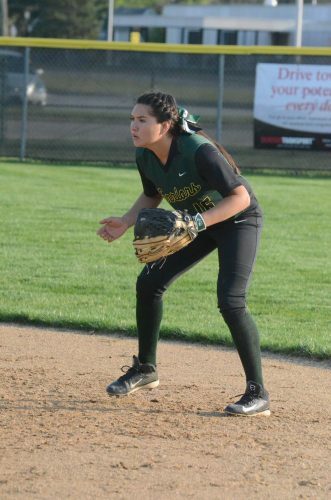 Seniors Gunkel and Cristina DeLaFuente each had three hits to pace Wawasee. The quartet of seniors Rostochak and Flores and juniors Fretz and Lemberg each had two hits. Wawasee won the junior varsity game 14-3. Bethany Flummery had a homer and Faith Swihart and Olivia Clouse each a triple for the JV Warriors. Wawasee plays in the Eastside Classic Saturday. Memorial hosts crosstown rival Elkhart Central Saturday evening. Meghan Fretz watches a pitch for Wawasee.